• For quantitative determination of starch and evaluation of drug effects on starch metabolism. • Use as little as 10 μL samples. Linear detection range: 2 to 200 μg/mL starch for colorimetric assays and 0.2 to 20 μg/mL for fluorimetric assays. • STARCH , chemical formula (C6H10O5)n, is a polysaccharide carbohydrate consisting of a large number of glucose units joined together by glycosidic bonds. All plant seeds and tubers contain starch present in the form of amylose and amylopectin. 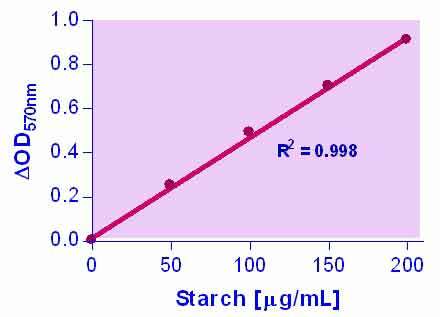 Starch is the most consumed polysaccharide in the human diet. Some starches are digested very quickly, and cause a rapid and large rise in blood sugar. Others are digested more slowly, and some starch, called resistant starch, is not digested in the small intestine at all, and thus causes little or no blood sugar rise. Simple, direct and automation-ready procedures for measuring starch concentrations find wide applications in research and drug discovery. BioAssay Systems starch uses a single Working Reagent that combines the enzymatic break down of starch and the detection of glucose in one step. The color intensity of the reaction product at 570 nm or fluorescence intensity at λex/em = 530/585 nm is directly proportional to the starch concentration in the sample. This simple convenient assay is carried out at room temperature and takes only 30 min. 1. What is the principle of the starch assay? Starch is first broken down into glucose molecules by α-amylase and amyloglucosidase. Next, glucose is converted to glucuronic acid and H2O2 by the enzyme glucose oxidase. Finally, H2O2 and ADHP are converted to the pink colored product resorufin and water by horse radish peroxidase. 2. What is the difference between soluble and resistant starch? 1. Iqbal S et al (2009). Feeding barley grain steeped in lactic acid modulates rumen fermentation patterns and increases milk fat content in dairy cows. J Dairy Sci. 92(12):6023-32. Assay: Starch in Plant Barley grain (Pubmed). 2. Zebeli Q et al (2011) Intraruminal administration of Megasphaera elsdenii modulated rumen fermentation profile in mid-lactation dairy cows. J Dairy Res 13:1-10. Assay: Starch in Plant Cow feed (Pubmed). 3. Gardner RD et al (2013). Comparison of CO(2) and bicarbonate as inorganic carbon sources for triacylglycerol and starch accumulation in Chlamydomonas reinhardtii. Biotechnol Bioeng. 110(1):87-96. Assay: Starch in Algae Chlamydomonas reinhardtii (Pubmed). 4. Boriboonkaset T et al (2012) Expression levels of some starch metabolism related genes in flag leaf of two contrasting rice genotypes exposed to salt stress. Aust. J. Crop Sci. 6(11):1579-1586. Assay: Starch in Plant Rice leaf (Pubmed). 5. Iqbal S et al (2009) Feeding barley grain steeped in lactic acid modulates rumen fermentation patterns and increases milk fat content in dairy cows. J Dairy Res 92(12):6023-32. Assay: Starch in food grain starch (Pubmed).